The next time the executive leaders at your organization get together, take a look around the room. (Or, if your position on the corporate ladder means you don’t attend these meetings, navigate to the section of the company website where executive bios are listed.) How many women are in the room (or on that webpage)? Chances are the number is pretty slim: According to the Center for American Progress, women hold roughly 52 percent of all professional-level jobs in America, but they only account for 14.6 percent of executive officers and 16.9 percent of board seats at Fortune 500 companies. Greenwell is executive vice president and chief operating officer at shoe retailer Finish Line, Inc. She is also a certified executive coach, a speaker, and the author of Money on the Table: How to Increase Profits Through Gender-Balanced Leadership. While many texts on the gender disparity at the top levels of corporate America approach the issue through a sociocultural lens, Money on the Table takes a different tack. Greenwell cites multiple sources to back up her argument, including a number of studies that have consistently found that organizations with more gender-balanced leadership teams tend to exceed average market capitalization. Late last month, Greenwell and I had a conversation about her book, which aims to be the go-to resource for corporate leaders in need of concrete strategies for achieving gender parity. What follows is a transcript of our conversation, minimally edited for style and clarity. 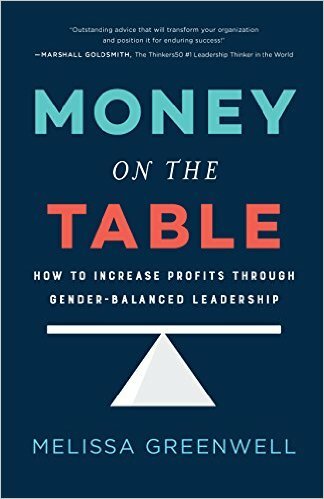 Recruiter.com: The central thesis of your book could be summed up with this line of yours: “Gender imbalances in leadership dilute business performance.” Could you expand on that a bit? Melissa Greenwell: It’s not to say that businesses that don’t have gender balance in leadership don’t perform well. Rather, the premise is that if we have more gender balance in leadership, we will be more productive and more profitable. It really relates to brain science. Men’s and women’s brains are physically different, which causes the genders to be predisposed to different ways of thinking, different ways of problem solving, and different levels of intuitiveness. If we’re missing either gender from the room, then we are probably not getting our best problem solving, and therefore, we are not creating the best solutions for our customers and clients. RC: That reminds me of another idea that comes up in the book, which is that when your leadership team doesn’t look like the customers you’re serving, it can lead to some problems. Why is that? MG: One of the CEOs I interviewed was running the beauty division of a major drug store, and he realized that all of the people on his team making decisions around what products to buy for women were largely men. You’re probably not making the best decisions for your customers if you can’t easily and directly relate to them. RC: As you make clear in the book, you approach the issue of gender imbalance from a monetary, business-oriented perspective. Why did you take that approach above all else? MG: First of all, the world is composed of roughly 50 percent women and 50 percent men, so women are not a minority. Diversity initiatives generally have been focused on efforts to get more minority groups involved and hired, and I really think this particular challenge is a little different. It’s easier to solve. I don’t think its something we should put under the broad umbrella of diversity, because we’ve been going at this from a diversity perspective for decades, and it has moved the needle very slowly. I think the problem will be more easily solved for if we understand the kinds of thinking and problem solving and solutions we’re missing because we don’t have both genders in the room. RC: While conducting research for the book, you interviewed 30 CEOs. Fifteen were men and 15 were women. Can you talk a little bit about the differences between these groups, with respect to their feelings on the matter of gender imbalance in leadership? MG: When you take all of them combined, there were really two groups of thought. First, there were the leaders who clearly understood the advantages of having gender balance in leadership. I would say roughly 50 percent of the male executives were in that group, and so were all of the female leaders I interviewed. The people that get it are the people who have been taking action for a long time now toward having more gender balance in leadership. The rest of the CEOs fell into a group that is thinking about it and clearly understands it is a challenge. It is a challenge they would like to solve, but quite frankly, they haven’t known what to do about it. They have largely chalked up women not being in leadership to the fact that they choose to stay home and take care of family, when in fact that’s not really true. Most women just find a different way of working instead of not working when they have families. RC: You spend a chapter in the book on gender imbalance in the tech industry, which you refer to as a “special case.” What makes it a special case? MG: It’s a special case because, if you look at all industries, it is the one with the very least balance in gender leadership. It has similar problems as other industries, but for whatever reason, when you look at senior leadership, the numbers are way worse in tech than they are in any other industry. RC: You look at some potential reasons why the numbers are worse in the book. Are there any you want to touch on here? MG: It starts very early in education, in the way that tech education and careers have not been marketed to young girls. We have to get to these students earlier, prior to college. We have to get to them in grade school and middle school. We have to get them to understand why a career in tech can be exciting and rewarding. It has not been a career that we typically encourage young women to take an interest in. It’s sort of a marketing problem. RC: For a big problem like that, how could we go about solving it? Does it start with the schools? MG: I think it starts with schools and parents. I think parents have to be careful in terms of how they socially condition their children to think about future aspirations. It’s not that different from corporate America. If female students don’t see other female students signing up for those classes or exhibiting interest, then they are not going to want to be there either. That’s what happens in corporate America: When women see there are no other women present, it’s a little intimidating. I think schools and parents can certainly create some initiatives that get girls interested in science and technology, like science fairs. There has to be a fairly uncomplicated way to tackle that. RC: You write that “the root cause of imbalance is fear.” Can you explain what you mean by that? MG: Everybody is afraid to change. Change can be scary. I think there’s fear on the part of women to raise their hands for opportunities because they feel like they are not 110 percent ready. There’s fear in approaching your boss to ask for more responsibility, more money, or a different title. I think with men – particularly the leaders who are making decisions around programs and policies – I think they fear making what they would consider exceptions for female talent by providing flexible work environments, for example. They may fear that will be viewed as favoritism, when in reality, they need to view it as an investment in their business, because they’ll be able to keep the best talent. RC: The book ends with ten steps men can take to help build gender-balanced leadership and ten rules for women who want to lead. On that note, how optimistic are you about achieving gender balance in corporate America? Is this something you think we can do soon, or will it be a protracted battle? MG: That’s a really good question – I wish my crystal ball would clear it up so I could give you an accurate answer! But here’s one thing I do know: The power of critical mass is what drives change, and if we can get enough people taking action, enough leaders creating different practices and policies and talking about this openly, eventually the world will catch on. I’ve seen this in my own company. We have made progress in terms of gender balance in leadership because we are now openly having the discussions and measuring it and focusing on it. So the needle is definitely moving. It’s just a matter of how quickly we’re going to make it happen.